For the answer, let us turn to Polybius, the Greek historian, who spent much of his life in Rome. His dates were ~ 200-118 B.C, so his observations and writings describe conditions during the third Punic War. In his sixth book of Histories, Polybius endeavored to explain why the Romans were able to defeat the phalanx. I quote him directly. “Why is it then that the Romans conquer? And what is it that brings disaster on those who employ the phalanx? Why, just because war is full of uncertainties both as to time and place; whereas there is but one time and one kind of ground in which a phalanx can fully work. If, then, there were anything to compel the enemy to accommodate himself to the time and place of the phalanx, when about to fight a general engagement, it would be but natural to expect that those who employed the phalanx would always carry off the victory. But if the enemy finds it possible, and even easy, to avoid its attack, what becomes of its formidable character? Again, no one denies that for its employment it is indispensable to have a country flat, bare, and without such impediments as ditches, cavities, depressions, steep banks, or beds of rivers: for all such obstacles are sufficient to hinder and dislocate this particular formation. And that it is, I may say, impossible, or at any rate exceedingly rare to find a piece of country of twenty strades, or sometimes of even greater extent, without any such obstacles, everyone will also admit. However, let us suppose that such a district has been found. If the enemy decline to come down into it, but traverse the country sacking the towns and territories of the allies, what use will the phalanx be? For if it remains on the ground suited to itself, it will not only fail to benefit its friends, but will be incapable even of preserving itself; for the carriage of provisions will be easily stopped by the enemy, seeing that they are in undisputed possession of the country: while if it quits its proper ground, from the wish to strike a blow, it will be an easy prey to the enemy. Nay, if a general does descend into the plain, and yet does not risk his whole army upon one charge of the phalanx or upon one chance, but maneuvers for a time to avoid coming to close quarters in the engagement, it is easy to learn what will be the result from what the Romans are now actually doing. The Romans do not, then, attempt to extend their front to equal that of a phalanx, and then charge directly upon it with their whole force: but some of their divisions are kept in reserve, while others join battle with the enemy at close quarters. Now, whether the phalanx in its charge drives its opponents from their ground, or is itself driven back, in either case its peculiar order is dislocated; for whether in following the retiring, or flying from the advancing enemy, they quit the rest of their forces: and when this takes place, the enemy's reserves can occupy the space thus left, and the ground which the phalanx had just before been holding, and so no longer charge them face to face, but fall upon them on their flank and rear. If, then, it is easy to take precautions against the opportunities and peculiar advantages of the phalanx, but impossible to do so in the case of its disadvantages, must it not follow that in practice the difference between these two systems is enormous? Of course, those generals who employ the phalanx must march over ground of every description, must pitch camps, occupy points of advantage, besiege, and be besieged, and meet with unexpected appearances of the enemy: for all these are part and parcel of war, and have an important and sometimes decisive influence on the ultimate victory. And in all these cases the Macedonian phalanx is difficult, and sometimes impossible, to handle, because the men cannot act either in squads or separately. Of course these conceptions are theoretical and represent methods of defeating the phalanx as a formation. The real life experiences of the Romans had more to do with tactics and the quality of the commanders than the phalanx formation itself. In my next post we will review some cases of the maniple against the phalanx to see whether the virtues of the Roman formation cited by Polybius were seen in real life. As mentioned in a previous post, Augustus was beside himself when told of the loss of three legions at Teutoburg and screamed “Quinctilius Varus, bring back my eagles!” Augustus was forever spooked by the massacre and commanded that his army retreat to the banks of the Rhine, avoiding all future designs on the German territory. He did not live to see the recovered eagles of the lost legions or get the revenge he must have wanted against Arminius. At the time of his death in 14 A.D, no plans had been made for dealing with the Germans. Tiberius, however, once he was named Caesar, wasted no time moving north to control the German tribes and gain revenge against Arminius. Even though Augustus’ death occurred as late as August 19th, an army under Tiberius’ nephew Germanicus was ordered to attack the Germans before year end. 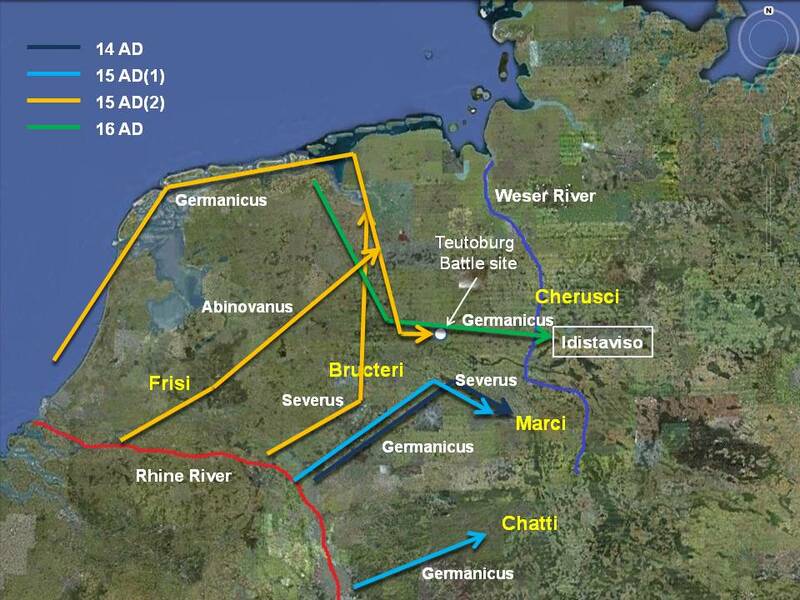 The map below shows Germanicus’ campaigns of 14-16 A.D. In 14 A.D. Germanicus ambushed the Marci and inflicted heavy losses. During its withdrawal to the Rhine, his army was attacked by the aroused Bructeri, Tubonti, and Usipedi tribes, but the Romans were able to escape after significant losses. In 15 A.D. there were two major campaigns. In the spring Legatus Caecina Severus attacked the Marsi a second time while Germanicus was defeating the Chatti. These attacks were preemptive and designed to suppress allies of the Cherusci so the latter could be attacked with less risk. In the second half of 15 Germanicus divided the Roman army into three parts, positioning them for simultaneous attacks. Severus attacked the Bructeri while Albinovanus attacked the Frisi. Separately, Germanicus came by sea and met up with them at the Amisia River. The combined armies fought their way to the head of the river which was near the site of the Teutoburg massacre. Germanicus erected a mound over the burial site containing the bones of the Roman soldiers and conducted funeral rites to honor the dead. On their way back to the Rhine, the Romans were ambushed again by Arminius, but this time Severus and Germanicus were able to fight their way out of the trap. Germanicus had additional difficulty with his withdrawal by sea when his ships could not be fully loaded because of shallow water. Part of his army had to march along the shoreline and many soldiers were swept away and drowned by the tides. During the campaigns of 15, Germanicus was able to retrieve two of the eagles lost in the Teutoburg battle (the third was not recovered until 41 A.D.). The year 16 A.D. brought an end to the Roman campaigns against the Germans. 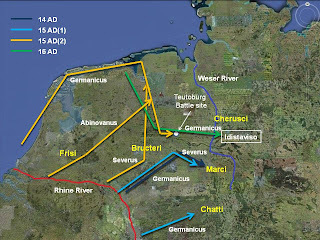 The main event that year involved Germanicus pushing across the Weser and defeating Arminius at Idistaviso. Recalled after the German campaign was complete, Germanicus received a triumph in May of 17 A.D. There is much debate about the Roman position vis a vis the Germans after the Teutoburg massacre. Many have taken the position that the loss of the three legions blocked forever Roman attempts to conquer Germany influencing the course of European development for the future. I think that point is debatable for at least two reasons. First, Tiberius ended the German campaigns because he felt the effort was not worth the losses incurred, not because of the massacre. He decided that the plan of letting the German tribes fight among themselves was a better strategy. Second, he had better uses of the army than post them in barbarian Germany. The fact that Rome never conquered Germany was more about the difficulty of accomplishing that goal given the strength and relationship between the German tribes than anything else. Rome would eventually reach Britain during the time of Claudius, but would never move east of Gaul after 16 A.D.